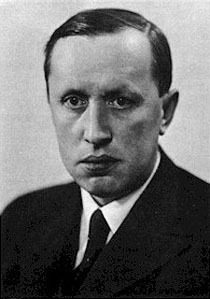 Karel Čapek (Czech: [ˈkarɛl ˈtʃapɛk] ( listen)) (9 Januar 1890 – 25 December 1938) wis a Czech writer o the early 20t century. He haed multiple roles throuoot his career sic as playwricht, dramatist, essayist, publisher, leeterary reviewer, an airt critic. Nonetheless, he is best kent for his science feection, includin his novel War wi the Newts an the play R.U.R., (Rossum's Universal Robots) which introduced the wird robot.